According to the biblical narrative, Zerubbabel[a] was a governor of the Persian Province of Judah (Yehud Medinata) and the grandson of Jehoiachin, penultimate king of Judah. Zerubbabel led the first group of Jews, numbering 42,360, who returned from the Babylonian captivity in the first year of Cyrus, King of Persia. The date is generally thought to have been between 538 and 520 BC. Zerubbabel also laid the foundation of the Second Temple in Jerusalem soon after. In all of the accounts in the Hebrew Bible that mention Zerubbabel, he is always associated with the high priest who returned with him, Joshua (Jeshua) son of Jozadak (Jehozadak). Together, these two men led the first wave of Jewish returnees from exile and began to rebuild the Temple. Old Testament theologian John Kessler describes the region of Judah as a small province that contained land extending 25 km from Jerusalem and was independently ruled prior to the Persian rule. Zerubbabel was the governor of this province. King Darius I of Persia appointed Zerubbabel governor of the Province. It was after this appointment that Zerubbabel began to rebuild the Temple. Elias Bickerman speculates that one of the reasons that Zerubbabel was able to rebuild the Temple was because of "the widespread revolts at the beginning of the reign of Darius I in 522 BC, which preoccupied him to such a degree that Zerubbabel felt he could initiate the rebuilding of the temple without repercussions". The Davidic line from Jeconiah had been cursed by Jeremiah, saying that no offspring of "Coniah" would sit on the throne (Jeremiah 22:30). Zerubbabel was of the main Davidic line through Solomon and Jeconiah. The prophets Zechariah and Haggai both give unclear statements regarding Zerubbabel's authority in their oracles, in which Zerubbabel was either the subject of a false prophecy or the receiver of a divine promotion to kingship. He could also be viewed as a governor of a state within another nation and thus technically "not on the throne" of a nation. Either way, he was given the task of rebuilding the Temple in the second year of the reign of Darius I (520 BC), along with the high priest Joshua son of Jehozadak. Muslim historian Ya'qubi attributed the recovery of the Torah and the Books of the Prophets to him instead of Ezra. The Seder Olam Zutta lists him as the Exilarch in Babylon to succeed Shealtiel. The texts[which?] are conflicting as to whether Zerubbabel was the son of Shealtiel or his nephew. His son Meshullam succeeded him as Exilarch, and was followed by another son Hananiah. His other sons were Hashubah, Ohel, Berechiah, Hasadiah and Jushab-hesed (1 Chronicles 3:20). He also had a daughter called Shelomith (1 Chronicles 3:19). Zerubbabel may have had a Babylonian style name because of his interaction with the Babylonian court. Ezra begins with Cyrus the Great entrusting the Temple vessels to Sheshbazzar (Hebrew: שֵׁשְׁבַּצַּר, Modern: Šešbaṣár, Tiberian: Šēšebaṣar, "prince of Judah", probably from Akkadian: 𒌓𒀜𒋀, translit. Šamaš-abu-uṣur); this apparently important figure then disappears from the story entirely (Ezra 1:8,11), and Zerubbabel is abruptly introduced as the main figure. Both are called governors of Judah and are both credited with laying the foundation of the Temple. A number of explanations have been proposed, including: (1) the two are the same person; (2) Sheshbazzar was in fact Shenazzar (probably from Akkadian: 𒂗𒍪𒋀, translit. Sîn-uṣur), Zerubabbel's uncle (mentioned in the Books of Chronicles); (3) Sheshbazzar began the work and Zerubbabel finished it. Zerubbabel appears in the prophecies of Haggai and Zechariah. "'On that day, says the Lord of Hosts, I will take you Zerubbabel, son of Shealtiel, my servant, and wear you like a signet ring; for it is you whom I have chosen. This is the word of the Lord of Hosts'" (Hag. 2:23). This quotation from the Book of Haggai illustrates the messianic expectations that are often associated with Zerubbabel. The term, "my servant," describes Zerubbabel as God's servant. This term is often associated with King David. Walter Rose concludes that: "the epithet 'servant' is hardly ever used for kings after David may be related to the fact that most of them were disappointing in their performance as kings appointed by YHVH". Rose emphasizes that the author of the Book of Haggai is associating Zerubbabel with King David. Scholars have also analyzed the phrase "I will take you." Rose associates this term with a mission, change, or protection. For Zerubbabel, this mission was likely the rebuilding of the second Temple. The most widely debated part of this prophecy is the phrase, "wear you like a signet ring." A signet ring is an authoritative symbol that is associated with power. Rose interprets this passage by comparing it to the passage in Jeremiah 22:24, in through which he concludes that the King is a signet ring on God's hand. John Kessler interprets the idea of the nature of the Signet ring as such that "the real true figure of speech at issue is a personification of which the simile or metaphor is only a part. The real trope consists of the personification of Yahweh, who is likened to the owner of a signet". However, this word when in Hebrew has been translated as meaning both seal and signet ring. "Zerubbabel is to be made either the representative of YHVH, or the new king who will restore the monarchy, or the new world leader. One sometimes finds words like messianic or Messiah used to describe Zerubbabel's role". According to Peter Ackroyd, Zerubbabel was "'a royal representative of God'". Both historians' interpretations of the prophecy of Haggai appear to understand the term of the "signet ring" as being a metaphor for Zerubbabel attaining God's authority on earth. "Haggai does not explain, however, for what Zerubbabel was chosen. From what is described in the prophecy—the overthrow of the kingdoms of the nations as the first stage in the choosing of Zerubbabel—we may conclude that Haggai sees Zerubbabel as a king, whose kingdom is made possible by a change in the political structure. ... [F]rom now on, since Zerubbabel has been chosen as a 'signet,' he will be 'sitting on the throne of David and ruling again in Judah'. All this, however, is only hinted at in the prophecy of Haggai and not stated explicitly". "Haggai is expressing the hope of a change in status of the province of Yehud, and of Zerubbabel's emergence as a king of a vassal state within the Persian empire". "The Promise of David…was now functioning in a new form, accommodated to the realities of the Persian period. Zerubbabel was not the ruler of a nation, but the governor of a province. Yet, such a provisional situation posed no inherent threat to the promise of the Davidic house". Some historians claim that Haggai's prophecy does not claim that Zerubbabel will become the King of the land of Judah. Rose's concludes that the imagery itself does not claim that Zerubbabel will be King of Judea. Rose also claims that "in Haggai's passage, one does not find a statement about Zerubbabel being YHVH's anointed, or about his autonomous rule (given by God), present or future, and there is no explicit promise that God will make the nations submit to his chosen one. One reads only about a mutual destruction of political and military forces masterminded by God. On the basis of these observations, I think it is safe to conclude that there is no reason to assume that divine intervention which does not mention autonomous rule or submission of the nations to Zerubbabel (Hag. 2) would necessarily imply a change of his position". "The absence of any reference to the Davidic line from which Zerubbabel came, and the failure to use words like "melech" … (related to the title of King)…point in a different direction". Falling in line with the rest of the twelve prophetic books of the Hebrew Bible (the Nevi'im), the book of Zechariah describes a hope for a future king, beyond the current leader Zerubbabel, and further establishes a portrayal of this future king. Anthony Petterson argues that the standard explanation of Haggai and Zechariah's prophesies, in which Zerubbabel was supposed to be the restorer of the Davidic dynasty but never fulfilled these expectations, does not actually stand as an explanation of the final form of these texts. There is a debate in the biblical scholarly community as to who the "sons of oil" is referencing. Though conventional wisdom often understood it to be Zerubbabel and Joshua, Boda argues that, because of the important role that prophets were said to play in the reconstruction of the Temple in Zech 8:9, Haggai and Zechariah are the sons of oil. It is unclear whether or not "the Branch" refers to Zerubbabel. Should this have been the intention of the author, then the restoration of the Davidic line of kings would be imminent, as Zerubbabel is a member of the line of David (1 Chron 3:19–20). There is some evidence for this link, namely that Zerubbabel was the governor of Judah at the time of Zechariah, he was frequently associated with Joshua (Ezra 3:2, 3:8), and he is also described as the Temple builder (Zech 4:9). However, there are several reasons that complicate this association. The first is that Joshua is the one crowned, not the Branch. The next is that Zerubbabel is not mentioned. The third is that the references to Zemah appear to anticipate a future event, while Zerubbabel existed in the present. Zechariah neither proclaims that Zerubbabel will restore the monarchy, nor does he contradict the previous hopes for a Davidic king (Hag 2:23). Rather, Zechariah maintains hope for a Davidic king in the future, without tying down the prophecy directly to Zerubbabel. References to Zerubbabel appear in the Books of Ezra, Nehemiah, and 1 Chronicles. This passage describes how Zerubbabel was part of the group who began to build the second Temple of Jerusalem. According to the Book of Ezra, Zerubbabel is also under the authority of King Cyrus of Persia to build the Temple (Ezr. 4:3). The passages describing Zerubbabel do mention the prophecies of Haggai and of Zechariah concerning Zerubbabel's actions in the land of Judah. Regarding Sheshbazzar, he was appointed governor of Judah by the Persian King Cyrus in the year 538 BCE, and was given gold and told to return to Jerusalem to rebuild the Temple. According to a letter from Tattenai (the governor of the province Beyond the River) to King Darius I, Sheshbazzar started the Temple, but it lay under construction for a long time. It seems as though Zerubbabel picked up construction shortly afterwards, in the 2nd year of Darius' rule (August 29, 520 BCE) (see Zerubbabel in Haggai). This is a contradiction, however, as Zerubbabel was said in Zechariah 4:9 to have laid the foundations of the new Temple, while Tattenai's letter to Darius says that Sheshbazzar laid the foundations of the Temple (Ezra 5:16). The final detail in the book of Ezra regarding Zerubbabel is a date for the completion of the second Temple. According to the Book of Ezra, "the house was completed on the third day of the month of Adar, in the sixth year of the reign of King Darius." In this passage, the word "house" refers to the second Temple. The reference to Zerubbabel in the Book of Nehemiah is rather brief. The author of the Book of Nehemiah only refers to Zerubbabel in passing when the author states that: "These are the priests and the Levites which came back with Zerubbabel son of Shealtiel and with Jeshua" (Neh. 12:1). The Book of Nehemiah provides no new information regarding Zerubbabel; however, Nehemiah seems to have replaced Zerubbabel as governor (Neh. 5:14). "The sons of Pedaiah: Zerubbabel and Shimei. The sons of Zerubbabel: Meshullam and Hannaniah; they had a sister Shelomith. There were five others: Hashubah, Ohel, Berechiah, Hasadiah, and Jushab-hesed" (1 Chronicles 3:19). Unlike the passages in Nehemiah, Haggai, and Ezra, 1 Chronicles appears to state that Zerubbabel is not the son of Shealtiel, but rather the son of Pedaiah. For a further explanation of this contradiction please see the section on Zerubbabel and his family. The Hebrew Bible lists Shealtiel as the second son of King Jeconiah (1Chronicles 3:17). The Neo-Babylonian King Nebuchadnezzar II exiled to Babylon Joconiah and Jeconiah's uncle King Zedekiah the last king of Judah and killed Zedekiah there. Potentially, Shealtiel became the legal heir to the throne, if the Davidic monarchy were restored. The Hebrew Bible has conflicting texts regarding whether Zerubbabel is the son of Shealtiel or of Pedaiah. Several texts (that are thought to be more or less contemporaneous) explicitly call "Zerubbabel the son of Shealtiel" (Ezra 3:2,8;5:2, Nehemiah 12:1, Haggai 1:1,12,14). The Seder Olam Zutta also supports that position. 1 Chronicles 3:17–19 makes Zerubbabel a nephew of Shealtiel: King Jeconiah is the father of Shealtiel and Pedaiah, then Pedaiah is the father of Zerubbabel. The text which identifies Zerubbabel as a son of Pedaiah could be a scribal error. It occurs in a part of the text where the Hebrew seems discongruent and possibly garbled (1 Chronicles 3:16–21). The expected mention of Shealtiel being a father seems accidentally omitted, and thus his children became confused with Pedaiah's. There may be other problems with these verses as well. In any case, those texts that call Zerubbabel "son of Shealtiel" have a context that is overtly political and seems to emphasize Zerubbabel's potential royal claim to the throne of the Davidic Dynasty by being Shealtiel's successor. Zerubbabel is understood as the legal successor of Shealtiel, with Zerubbabel's title paralleling the High Priest Jeshua's title, "son of Jozadak", that emphasizes Joshua's rightful claim to the dynasty of high priests, descending from Aaron. Therefore, with one descending from David and the other from Aaron, these two officials have the divine authority to rebuild the Temple. In the New Testament, the name Zerubbabel appears in both versions of the genealogy of Jesus. In Luke's genealogy from Nathan (son of David) there is also a "Zerubbabel son of Salatiel" (different spelling from Matthew), but this Zerubbabel is grandson of Neri, not Jeconiah, and his son is Rhesa not Abiud. (Luke 3:27). These genealogies do not match the genealogy presented in 1 Chronicles; various explanations have been suggested[clarification needed]. Zerubbabel is mentioned in both the books of Sirach and 1 Esdras. Zerubbabel is listed alongside Jeshua (Joshua) son of Jozadak and Nehemiah as a leader of the restoration of the Temple. Notably, Ezra is missing from this honor. This portion of the text of Sirach is a list and brief description of the famous rulers, prophets, and ancestors of the kingdom of Judah (beginning in chapter 44). "If she smiles at him, he laughs; if she loses her temper with him, he flatters her so that she may be reconciled with him. Gentlemen, why are not women strong, since they do such things?" (1 Esd 4:31–32). This speaker is told (in parentheses) to be Zerubbabel, but this detail was likely tacked onto a secular, Hellenized tale about the power of wine, kings, truth, and women. :29 The author of 1 Esdras might have done so to glorify the power of Zerubbabel, the description of which is unparalleled in Ezra, Nehemiah, and Haggai, as the aforementioned books all discuss the power of Zerubbabel in accordance to the power of the high priest Joshua. After Zerubbabel wins the competition, he is given sanction to rebuild the Temple and return the sacred Temple vessels that Nebuchadnezzar II had preserved after the conquest of Babylon. It is also probable that the author of 1 Esdras included this reference to Zerubbabel to alleviate any confusion about the difference between Zerubbabel and Sheshbazzar that was apparent in the original book of Ezra. The account of Zerubbabel in 1 Esdras is almost identical to the account of Zerubbabel in the Book of Ezra, included in the Kethuvim. This is because many scholars believe that 1 Esdras is a Greek version of the Book of Ezra. However, there are a few details that appear in 1 Esdras and not in the Book of Ezra. The first discrepancy is that 1 Esdras refers to Zerubbabel's son as Joakim (1 Esd. 5:5). However, this is not one of the sons included in the genealogy included in 1 Chronicles and the Book of Ezra makes no mention of Zerubbabel's son. The second discrepancy is that the author of 1 Esdras claims that it was "Zerubbabel who spoke wise words before King Darius of Persia" (1 Esd. 5:6). However, there is no passage similar to this in the Book of Ezra. Finally 1 Esdras mentions a person called Sanabassar as the Governor of Judah and that it was he who laid the foundation for the first temple (1 Esd. 6:18–20). Sanabassar may refer to Shashbazar. However, according to the Book of Ezra, Zerubbabel is the governor of Judah and he laid the foundation for the Temple. He was given sanction to rebuild the Temple and return the sacred Temple vessels that Nebuchadnezzar II had preserved after the conquest of Babylon. Praise of Truth by Phillips Galle after Gerard Groenning 1638. Five versions pick truth as strongest after discussing the merits of women. Bozon’s omission of the "Esdras sequel on truth" was either deliberate or "not available in the account he is following. :55 Le Fèvre “makes Zorobabel a fourth speaker, championing truth after the other three nominations have been aired by three preceding speakers”. :55 Lope De Vega also ignores truth. Walker observes that De Vega used several historical sources in addition to 1 Esdras. Four versions (Esdras, Josephus, Gower and Collier) mention the courtesan Apame who took the crown of Darius in Esdras and Josephus (in Gower Apemen is courtesan of Cyrus). Collier follows Esdras fairly closely and "ends with a pious expression of the poet's submission to divine will:". The contest inspired six sixteenth century artists to create prints illustrating the four powers. Veldman has located works by Philips Galle, Johannes Wierix, Pieter Perret, Zacharias Dolendo, Nicolaus Knüpfer and Christoffel van Sichem. The last work dates from 1657. The disappearance of 1 Esdras from the Dutch bible "would certainly have contributed to the sudden decline in the riddle’s popularity". Many authors consider "truth" to be the core of this story. Some modern critics view "women" as the focus as they were often belittled in biblical and medieval texts. Milton disagrees with Zorobabel and asserts that “truth and justice are all one”. Though he is not mentioned in Craft Freemasonry, Zerubbabel is considered to be of great importance to a number of Masonic bodies. Within the Holy Royal Arch, and Royal Arch Masonry he is considered to be a ruling principal. He is the receiver of an apocalypse in the seventh-century Apocalypse of Zerubbabel, also known as Sefer Zerubbabel. This text contains a prophecy given to Zerubbabel from God. It is very similar to the style of the prophecy given in 1 Enoch. The prophecy contains messianic imagery and Zerubbabel is told the future of the city of Jerusalem. He plays a large role in Sholem Asch's final work The Prophet. 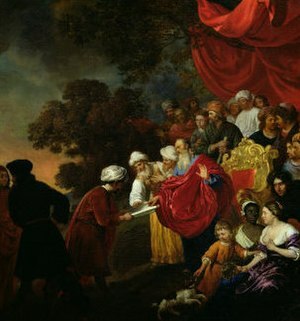 He is announced as the Prince of Judah upon his return to the Holy Land. One of the firm and long-standing followers and friends of the Prophet Isaiah, and descendant of the Davidic Dynasty. Wikisource has the text of the 1920 Encyclopedia Americana article Zerubbabel. Wikimedia Commons has media related to Zorobabel. ^ Janet E. Tollington, Tradition and Innovation in Haggai and Zechariah 1–8 (Sheffield, England: Sheffield Academic Press, 1993), 132. ^ John Kessler (28 February 2006). Michael Floyd; Robert D. Haak (eds.). Prophets, Prophecy, and Prophetic Texts in Second Temple Judaism. A&C Black. p. 104. ISBN 978-0-567-02780-1. ^ Michael H. Floyd and Robert D. Haak Eds. Prophets and Prophetic Texts In Second Temple Jerusalem. (New York, T & T Clark International, 2006). 104. ^ Diana Edelman. The Origins of the 'Second' Temple: Persian Imperial Policy and the Rebuilding of Jerusalem. (Oakville, CT, Equinox Publishing Ltd, 2005). 2. ^ Reeves, John C. (2005). Trajectories in Near Eastern Apocalyptic: A Postrabbinic Jewish Apocalypse Reader. Society of Biblical Literature. ISBN 1-58983-102-0. ^ "Zerubbabel." Encyclopaedia Judaica online. 2nd ed. Macmillan Reference, Detroit, USA, 2007. Gale Virtual Reference Library. Retrieved 6 Dec. 2010. ^ Winckler, Altorientalische Forschungen, ii. 439, 440. ^ Thomas Kelly Cheyne; John Sutherland Black (1903). Encyclopaedia Biblica: A Critical Dictionary of the Literary, Political and Religious History, the Archaeology, Geography and Natural History of the Bible. Adam and Charles Black. pp. 4453–. ^ Walter H. Rose, Zemah and Zerubbabel: Messianic Expectations in the Early Postexilic Period. (Sheffield, England Sheffield Academic Press 2000), pg 211. ^ John Kessler (28 February 2006). Michael Floyd; Robert D. Haak (eds.). Prophets, Prophecy, and Prophetic Texts in Second Temple Judaism. A&C Black. p. 113. ISBN 978-0-567-02780-1. ^ a b Anthony R. Petterson, "The Shape of the Davidic Hope across the Book of the Twelve," Journal for the Study of the Old Testament 35 (2010): 225–246. ^ "Zerubbabel", Jewish Encyclopedia 1908. ^ a b c S. A. Cook (1913). "1 Esdras: Introduction". In R. H. Charles (ed.). The Apocrypha and Pseudepigrapha of the Old Testament in English. ^ Charles C. Torrey (1910). EZRA STUDIES. University of Chicago Press. ^ John C. Dancy (2001). The Divine Drama: The Old Testament as Literature. p. 694. ISBN 978-0-71882-987-2. ^ a b c d e Alcuin Blamires (1998). "2 The Formal Case: Origins, Procedures". The Case for Women in Medieval Culture. Oxford University Press. pp. 50–59. ISBN 978-0-19-818630-4. ^ Josephus. "3.5". Antiquities of the Jews. ^ Nicole Bozon. "54. De fortitudine miilieris". Contes moralisés. pp. 75–76. ^ Jehan Le Fèvre. "Livre de Leësce line 65ff". Lamentations. ^ Lope De Vega. "Contra Valor No Hay Desdicha". In Menéndez Pelayo, Marcelino (ed.). Obras de Lope de Vega, XIV: comedias mitológicas y comedias históricas de asunto extranjero. pp. 288–329. ^ Mary Collier (1739). The Woman's Labour: an Epistle to Mr. Stephen Duck: in Answer to His Late. ^ Naomi R. Walker (April 1, 2014). "The Greek, the Roman, and the Persian King: Lope De Vega's Use of Historical Source Material for the Play Contra Valor No Hay Desdicha". Bulletin of Hispanic Studies. ^ Bridget Keegan (1 October 2005). "Mysticisms and Mystifications: The Demands of Laboring-Class Religious Poetry". Criticism (47.4): 471–491. ^ Ilja M. Veldman (1987). "Who Is the Strongest? The Riddle of Esdras in Netherlandish Art". Simiolus: Netherlands Quarterly for the History of Art (17.4): 223–239. JSTOR 3780619. ^ Samantha J. Rayner. Images of Kingship in Chaucer and His Ricardian Contemporaries. pp. 12–14. ^ Gower gives full play to his ability as a moralizer in declaring somewhat ironically that the king is inferior to a woman, not to speak of truth. Masahiko Kanno. John Gower's View of Word and Rhetoric (PDF). p. 23. ^ Zerubbabel argues that truth is the strongest force in the world and attributes truth to his God. Mark McEntire. An Apocryphal God: Beyond Divine Maturity. p. 64. ^ For truth is properly no more than contemplation; and her utmost efficiency is but teaching: but justice in her very essence is all strength and activity; and hath a sword put into her hand, John Milton (1649). "Justice above the King". Eikonoklastes. ^ Mackey, Albert G. M.D. : Encyclopedia of Freemasonry and its Kindred Sciences, page 1040. McClure Publishing Co., 1917. ^ Strack, Hermann Leberecht; Gunter Stemberger (1992). Introduction to the Talmud and Midrash. Markus Bockmuehl (trans.). Fortress Press. p. 327. ISBN 0-8006-2524-2. ^ Asch, Sholem (1955). The Prophet. Arthur Saul Super (trans.). G.P. Putnam's Sons. p. 343.